Birds of all types and sizes are certainly captivating and fascinating creatures, but some of the most impressive of all are the large birds. This is particularly true of the large parrot species. From cockatoos to macaws, these species are also commonly kept in captivity and make excellent pets for the right person. These birds know no ends to their talents. Many of them can learn to talk, perform tricks, and complete a variety of tasks. This is sure to delight their owners and enrich the bonds that they share with them. Most of all, these birds have endlessly charming personalities. Many would even argue that they are some of the most affectionate pets in the animal kingdom. It is important to remember that larger birds require more space than smaller species. You will want to ensure your aviary can accommodate all of their needs. Consider that these birds tend to be vocal and rather loud, the expenses associated with their care can be higher, and they tend to live far longer than smaller birds. And yet, if you're ready for the commitment, these majestic creatures can bring you a lot of joy. 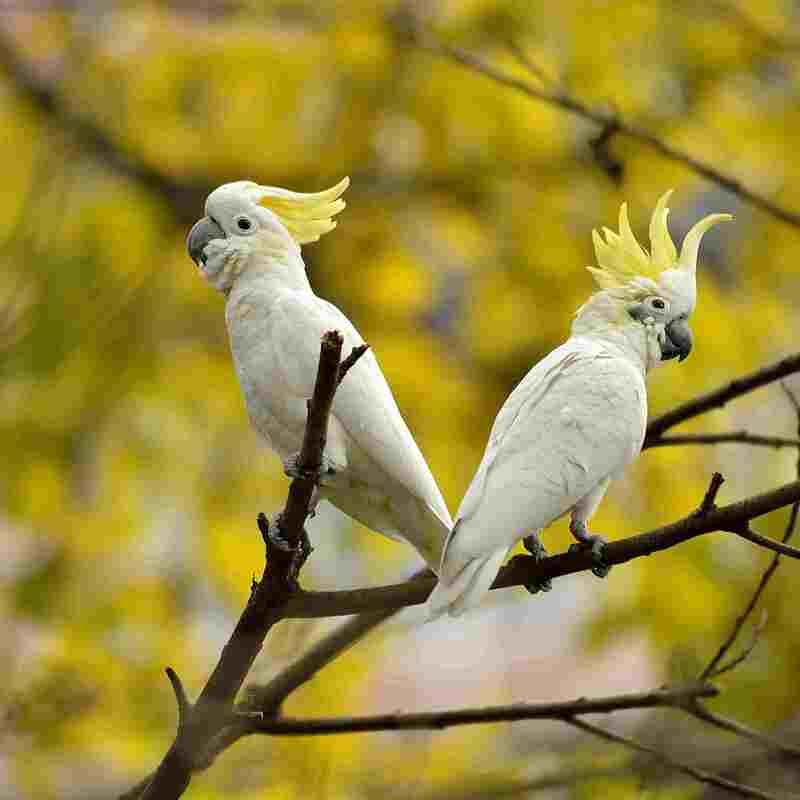 Originating in Australia, there are as many types of cockatoos as there are colors of the rainbow. One thing that they all have in common is that they make incredibly affectionate and loving pets for the right people. Caring for a cockatoo can be a tough job. They require many hours of direct interaction each day and thrive on their owners' companionship. Anyone who adopts a cockatoo must make sure that they have plenty of free time to spend with their birds. Without it, a cockatoo will not be very happy in captivity. Cockatoos can also be quite vocal, though some, such as the citron cockatoo can be relatively quiet. This is an important point to consider, especially if you have close neighbors. For those who are up to the task, these birds can provide a wealth of love and companionship. The Eclectus parrots also hail from "Down Under." They have charming and affectionate personalities when properly socialized and are very intelligent. These birds are unique in that they are a dimorphic species. This means that the males can be discerned from the females by the colors of their feathers. The male Eclectus is a bright green color, with red and blue accents on the undersides of his wings. The females are a brilliant red color, with vivid purple bellies. Both males and females are beautiful and make excellent pets, though some people think that males are easier to train. If you hope to have a multi-bird household, Eclectus tend to do rather well. However, some individuals can get a little jealous. The Eclectus requires a slightly different diet than other birds. Their digestive system requires a good amount of fiber, so you'll want to have plenty of fresh fruits and vegetables available. Also, to keep their colors bright, it's often recommended to avoid foods with artificial dyes. As their name makes evident, the beautiful African grey parrots are originally from Africa. They are widely known as some of the most intelligent bird species on the planet. Many studies have been done on these birds, and the results have been astounding. Some have even found that they have the intellect and emotional capacities of human toddlers, which is pretty incredible! Like a child, you need to be careful what you say around them. They've been known to give away very personal secrets and pick up foul language. These birds may not have the brilliant colors of other parrots, but they are no less beautiful. The monochromatic shading in their feathers is stunning. This is offset by either bright red or deep maroon tail feathers, depending on the specific species. African greys need special owners that have a deep commitment to caring for them. They need lots of human interaction, mental stimulation, and socialization in order to thrive as pets. It's important that anyone who adopts one makes sure that they can meet their needs. The strikingly beautiful Amazon parrot comes from South America, where they make their homes in warm and humid climates. Even so, they have grown to become popular pets all around the world. These birds are very clever and many become proficient talkers, building impressive vocabularies and speaking with great clarity. They are affectionate and known for forming very strong bonds with their human caretakers. Amazon parrots can live for a very long time in captivity, even in excess of 60 years. For this reason and more, it's very important that anyone interested in keeping one as a pet has the desire and the means to commit to providing excellent care for them. The markings on Amazon parrots varies, though most of their feathers are dominated by shades of green. From the red and blue patches of the green-cheeked Amazon to pops of yellow on the more docile mealy Amazon, they're all as beautiful as they are talented. The bold macaws are some of the most easily recognizable birds on the planet. No doubt, this is due to their popularity in movies and bird shows around the world. It's no wonder that these birds are a favorite of those in the entertainment industry. They are beautiful, intelligent, and highly trainable, capable of learning to mimic speech as well as perform a variety of tricks and commands. Like other large birds, macaws make loving pets who bond strongly with their owners and need lots of interaction. Make sure that you are able to provide a macaw with several hours of social time each day before rushing out to bring one home. While you may recognize the stunning red of the greenwing macaw or scarlet macaw, there are others. Blue and gold macaws are also quite familiar, and you can look into adopting the military macaw or Illiger's macaw. For a smaller bird, consider the little green Hahn's macaw.